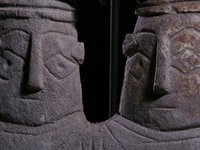 Watch video Pagan, between India and China by Claudine Bautze-Picron The pictorial art of Pagan offers a wide spectrum of aspects which reflect the internationality of the city and its region from the eleventh up to the early fourteenth century. 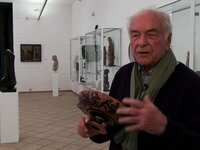 Watch video Les bois qui murmurent - Les supports sculptés de la pensée Lobi par Viviane Baeke, conservateur au Musée Royal d'Afrique Centrale (tervuren) Musée Royal de l'Afrique Centrale (Tervuren) simultanément à l'exposition : Les bois qui murmurent- La grande statuaire Lobi de la collection François & Marie Christiaens. Watch video Buddhist Initiation Paintings of the Yuan period (1271-1368) in the Sino-Himalayan style by Jane Casey This lecture examines a group of small initiation paintings, rare surviving examples of a Himalayan-inspired school of art that flourished at the Chinese Yuan court. Watch video Unity and Diversity - 40 Years of Excavations in the New Kingdom Necropolis at Saqqara by Dr. Maarten Raven Curator of the department of Egyptology at the Rijksmuseum van Oudheden (National Museum of Antiquities), Leiden. Watch video Exhibition Fight Pray Love - Anton Bartholomeew Collection of Mogul and Sikh arms, armors and paintings… An exhibition held in an exceptional “Art Nouveau” building from the Belgian architect Victor Horta during Asian Art in Brussels Fair. 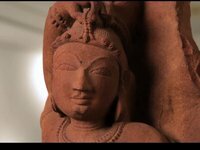 Watch video Pierre Baptiste : From India to continental Southeast Asia: the diffusion of Buddhist Iconography (eng) by Pierre Baptiste, curator in charge of the Southeast Asian art department of the Musée Naional des Arts Asiatiques - Guimet. Watch video “I have reached the sky as a grasshopper…” . The role and the meaning of the grasshopper in ancient Egypt by Jan Koek, Chairman of Mehen, Studycentre of ancient Egypt. Watch video Isis Magicienne - Dr. Olivier Perdu Olivier Perdu est un égyptologue attaché à la chaire de Civilisation pharaonique du Collège de France. 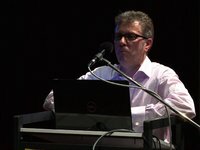 Watch video BIAPAL ART HERITAGE SERIES #01 : Dr. Maarten Raven in Leiden by Dr. Maarten Raven Curator of the department of Egyptology at the Rijksmuseum van Oudheden (National Museum of Antiquities), Leiden. Watch video BIAPAL ART HERITAGE SERIES #1 EP 02 - Highlights of Saqqara at the National Museum of Antiquities, Leiden with Dr. Maarten Raven by Dr. Maarten Raven Curator of the department of Egyptology at the Rijksmuseum van Oudheden (National Museum of Antiquities), Leiden. Watch video The Sculptures of Western Tibet in the 11th to 13th centuries and their artistic debt to Kashmir by Dr. Amy Heller. This presentation evokes the historical, iconographical and aesthetic relationships of Kashmiri metal sculptures and the ones they inspired in the kingdoms of Gu.ge-Pu.hrang and Ladakh. Watch video Dr. Amy Heller Interview We interviewed Dr. Amy Heller about her research in Europe and China just before the fascinating lecture she gave about " The Sculptures of Western Tibet in the 11th to 13th centuries and their artistic debt to Kashmir"
Watch video Supernatural Themes in Manjū Netsuke from the Ashmolean Museum, Oxford by Joyce Seaman. This lecture look at subjects related to the supernatural, drawing on examples from the Ashmolean’s collection to discuss demons malign, benign and humorous, and their appearance on nineteenth-century manjū netsuke. Watch video Unknown Egyptian Treasures at the Museum August Kestner, Hanover by Dr. phil. Christian E. Loeben - Curator of the Egyptological collection of the Museum August Kestner, one of the most comprehensive collection in Germany. Watch video Maps of East Asia in the early to mid-Nineteenth Century by Dr. Richard Pegg Dr Pegg presents here, through comparison, certain similarities and distinctive differences in the representations of space, both real and imagined, in the early modern cartographic traditions of China, Korea and Japan. 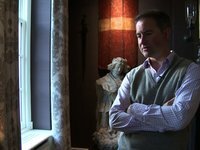 Watch video Connoisseurship, Collectors and Museums by James Ede. In view of recent criticism of the trade in antiquities and of the private collecting of ancient art, it will focus on the importance of private collectors to the formation of museums, to the development of archaeology, and to the study of ancient art history. 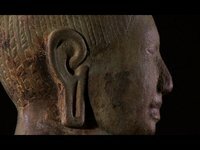 Watch video On Khmer Sculpture – Very personal comments on a life-long journey by Dr. Wolfgang Felten and Dr. Susanne Schreiber. This Podium Talk with the collector Dr. Wolfgang Felten and art journalist Dr. Susanne Schreiber highlight little known peculiarities of Khmer art and its importance within the art history of Asia. Watch video An interview with Dr. Pratapaditya Pal Former Curator of Boston Museum, Los Angeles County Museum of Art, Art Institute of Chicago and prolific author... An interview with a world specialist of Indian, the Himalayas and South East Asia Art about his life journey as a curator and specialist of Asian Art. 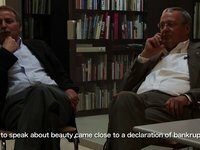 Watch video Interview with Dr. Sidney Goldstein Dr. Sidney Goldstein is considered as one of the world specialists on antique glass. From 1973 to 1983, he was the chief curator of Corning Museum of Glass (USA), the world's largest glass museum. Until his retirement, he was Associate Director and Curator of Ancient and Islamic Art at the Saint Louis Art Museum. Watch video David Pritzker : The Material Culture in The Royal Nomadic Court of Imperial Tibet (7th-9th) In the 7th century Tibet arose as newcomers on the stage of history. This talk will explore how the royal aesthetics of their nomadic court exemplifies an energy and spirit unique to the explosive and short-lived Tibetan Empire (7th-9th centuries). Watch video How Scorn turn to Love... The Powerful Impact of Netsuke. Video of the lecture Max Rutherston gave with humour and comprehensive knowledge about netsuke. 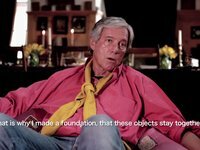 Watch video Interview with Alain Bordier, founder of the Tibet Museum. 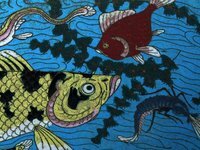 In this interview, Alain Bordier, tells us with honesty and simplicity, how he became a major collector of Tibetan art and talks about his experience of collecting. A peacefull chat about art, beliefs and passion in his museum in Switzerland. Watch video Interview with Jacques Léon Theodor at the Museum of Louvain-la-Neuve, Belgium. 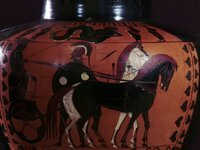 An interesting talk about collecting Greek vases and the use of sharing knowledge through donations with a world famous collector, biologist and speleologist. 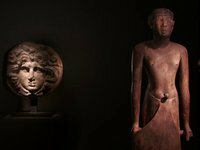 Watch video Lucien Viola : The making of a new museum in the Medina of Marrakesh Lucien Viola presents the museum and the artworks that will show four main collections of ancient Moroccan art. Watch video Two Densatil Lokapala heads 15th century Gilded copper with inlays of semi-precious stones H. 23.5 cm & 24 cm. Watch video Sarcophagus for the mummy of a sacred ibis Egypt, Ptolemaic Period, 3rd century BC – Polychrome wood – Height: 23 cm. Length: 44 cm. 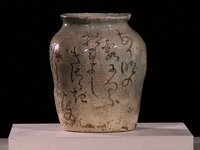 The piece is inscribed with a demotic text. Watch video Triad of Fudō Myō-ō - 不動明王 - and his attendants Japan, Momoyama, Edo period, 16th-17th century Wood - H 27,5 cm (central figure). 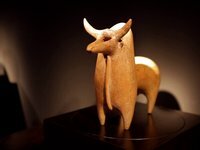 Watch video Relief with agricultural scene – Egypt, late 25th-26th dynasty: c. 660-650 BC Polychrome limestone. Height: 16.6 cm. Width: 16.6 cm Provenance: tomb of Mentuemhat (TT34). Private collection in France, acquired 1960–70s Will be shown during Brussels Ancient Art Fair June 4-8, 2014. 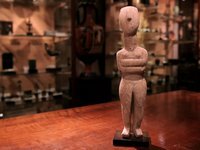 Watch video Statue of a dignitary wearing a long loincloth Egypt, Wood. H.: 55.5 cm. 6th dynasty, approximately 2350-2150 BC. 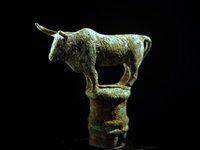 Watch video Sceptre handle representing ox on a drum China, Yunnan Province, Dian culture, Warring states period. 475-221BC. Bronze with green patina, 7cm.